HÀ NỘI — Vietnamese shares advanced on Wednesday on foreign investors’ purchases for listed commercial banks. The benchmark VN-Index on the Hồ Chí Minh Stock Exchange rose 0.18 per cent to close at 908.18 points. The southern market index fell 0.49 per cent on Tuesday. The HNX Index on the Hà Nội Stock Exchange inched up 0.13 per cent to end at 102.67 points. The northern market index bounced back from a 0.80 per cent drop on Tuesday. Foreign purchases for listed commercial banks boosted the stock market on Wednesday. Foreign investors bought total net value of VNĐ58.9 billion (US$2.53 million), focusing on Vietinbank (CTG), Sacombank (STB) and TPBank (TPB). The three bank stocks gained 3.8 per cent, 3.4 per cent and 2 per cent, respectively. The banking sector index was up 0.6 per cent, data on vietstock.vn showed. 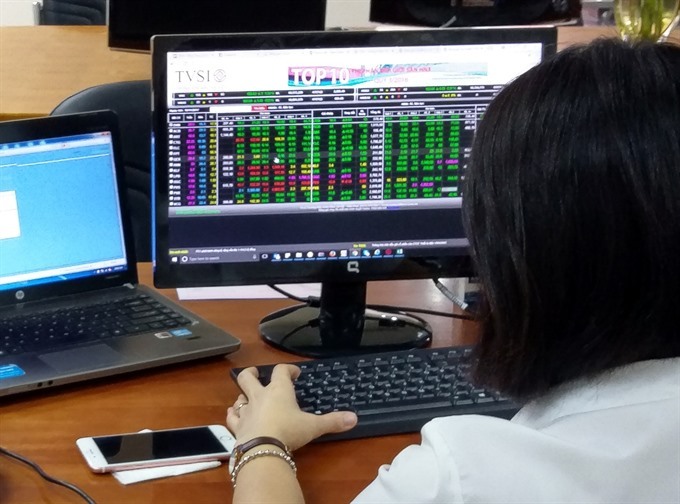 “I am optimistic the stock market will perform well in the first quarter of this year and as the VN-Index is consolidating in the 880-920 point zone, it will make the expected short-term uptrend more consistent,” Nguyễn Trung Du, analyst at VNDirect Securities Corporation said. “This is a good time for investors to pick good stocks” and “sector-leading stocks would be safer choices than small- and medium-cap ones,” he said. Along with bank stocks, securities firms also performed well to push the brokerage index on vietstock.vn up 0.4 per cent. Gainers in the brokerage sector included Artex Securities (ART), HCM City Securities (HCM), FPT Securities (FTS) and Vietinbank Securities (CTS). On the opposite side, consumer staples, healthcare and pharmaceuticals, and retail sectors weighed on the market performance as their indices lost between 0.2 per cent and 0.6 per cent. Market trading liquidity remained modest with more than 152 million shares being traded, worth VNĐ2.95 trillion. “The stock market is undergoing the last trading sessions of the lunar year so investors may want to offload their assets to avoid potential risks that may arise during the nine-day holiday, pressurising the market to decline in coming days,” Artex Securities Corp wrote in the report. “There is little improvement in the market trading liquidity, proving investors are quite quiet at the moment,” it said.